In Episode 7 of the Native Waters on Arid Lands podcast, we speak with Dr. Michael Dettinger of the U.S. Geological Survey about the past, present and likely future of climate change in the Great Basin and American Southwest. We also discuss a set of climate projections that he has prepared for tribal reservations located in the Native Waters study area. Dettinger is a senior research hydrologist for the U.S. Geological Survey’s National Research Program, a resident scientist at the University of Nevada, Reno, a research associate of the Scripps Institution of Oceanography, and adjunct faculty with the Division of Atmospheric Science at the Desert Research Institute in Reno, NV. Listen to the podcast and read below to learn more about Dettinger and his work. You can subscribe to this podcast on iTunes, Google Play and Stitcher. Native American tribes of the Great Basin and American Southwest have survived in the region’s arid landscape for thousands of years, and during that time, have experienced extreme changes in climate such as temperature changes and drought. 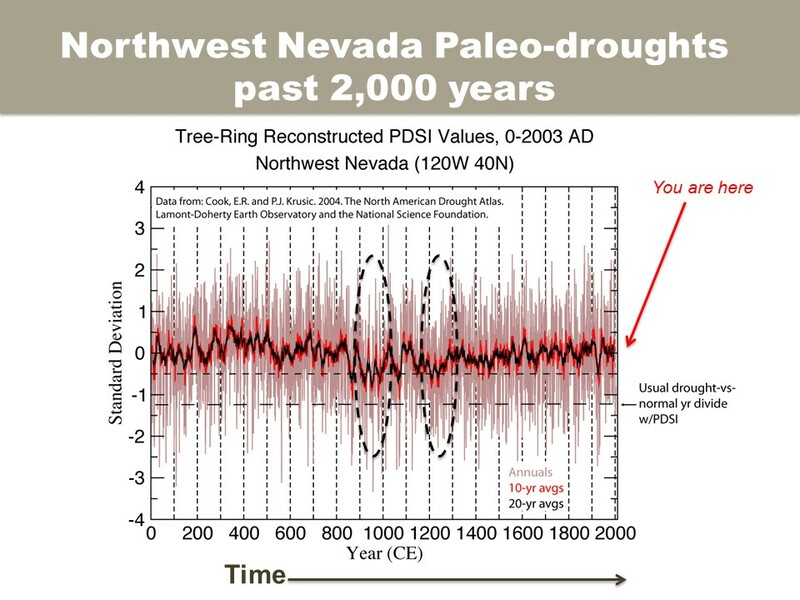 As part of the Native Waters on Arid Lands project, Dettinger looks to the paleo record (using data sources such as tree ring records) to help team members understand how the climate conditions of today compare to what people of the Great Basin experienced in the past. He also uses climate models to make projections for temperature and precipitation to help the team understand the changes that may occur on tribal reservations of the Great Basin and Southwest in the future. 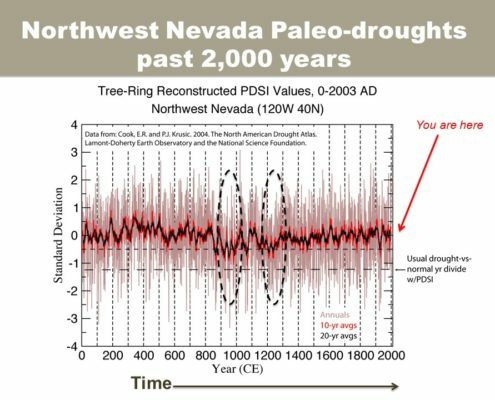 At present, as Dettinger explains in the podcast, temperatures in the Great Basin are warmer than they have been for the past several thousand years. 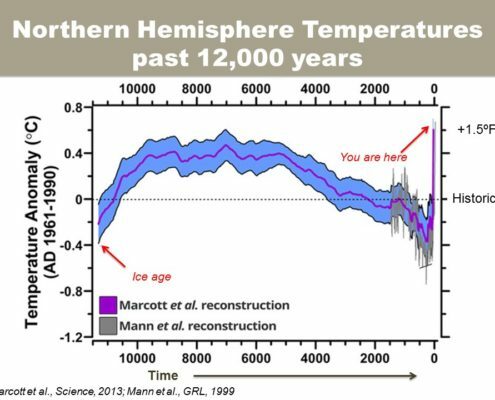 The paleo record holds evidence of long-term droughts called megadroughts, which lasted for decades, and could occur again at any time. 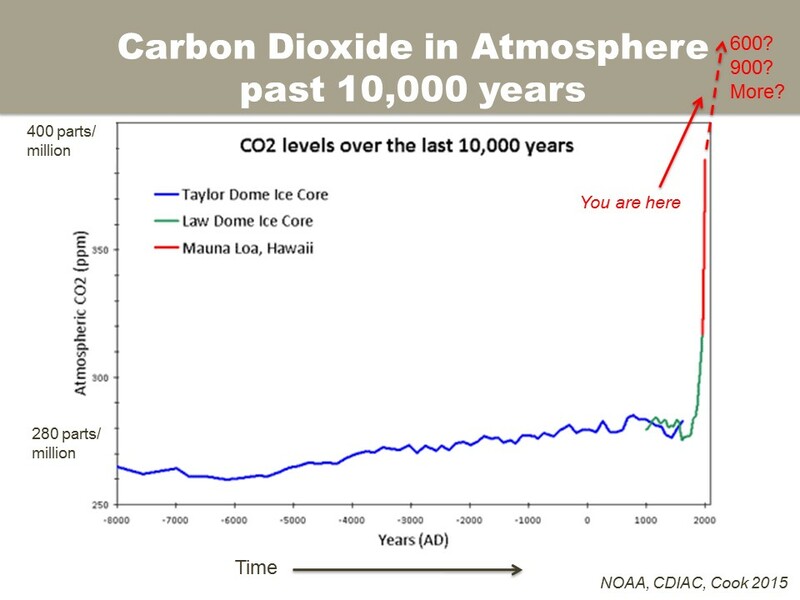 And our modern-day atmospheric CO2 levels are increasing dramatically, with no sign of slowing down. 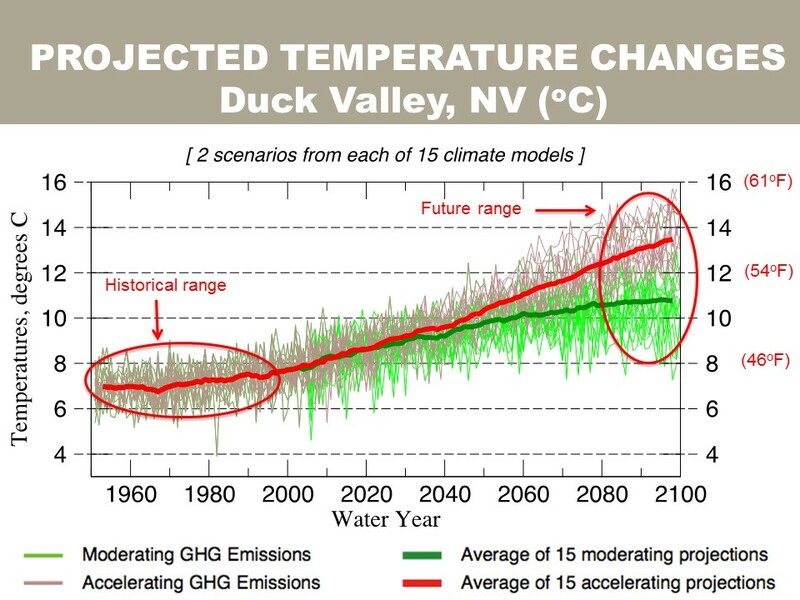 To learn what the future holds for tribal reservations in the Southwest, Dettinger uses a combination of 15 global climate models to create projections for temperature and precipitation through the year 2100. These models incorporate two emissions scenarios – a “business as usual” scenario in which global emissions continue to grow rapidly, and a “greener” scenario in which emissions begin to level off. 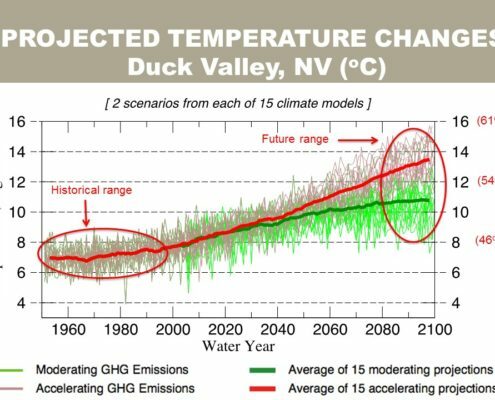 Dettinger’s climate projections focus on ten reservations in the Native Waters study area — the Colorado River, Duck Valley, Duckwater, Gila River, Hopi, Navajo, Pyramid Lake Paiute, Uintah and Ouray, Walker Lake, and Zuni reservations. 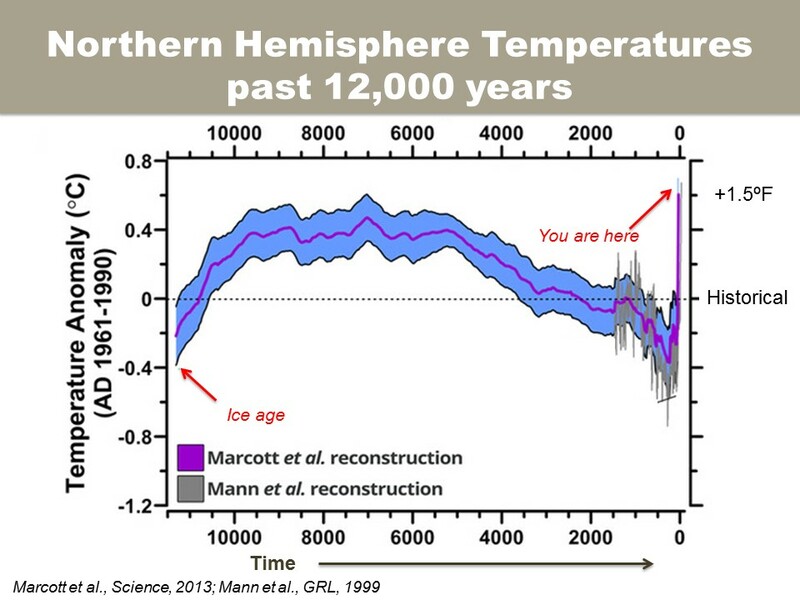 The projections show increases in temperature on all reservations by the end of the century, although the amount of increase varies by location and by emissions scenario. 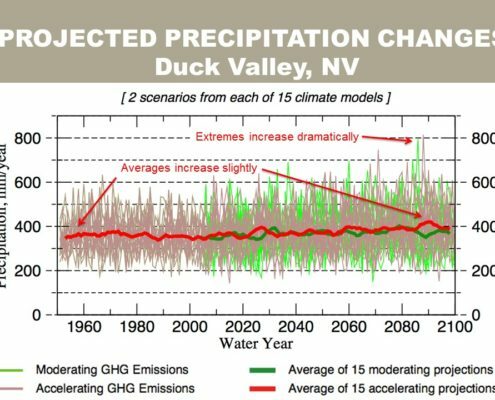 As for precipitation, the projections show slight increases in some regions of the Great Basin and Southwest, and slight decreases in other regions. The most notable trend is an increase in precipitation extremes such as droughts and floods. This means that in the future, the wet periods are likely to get wetter and the dry periods are likely to get drier. 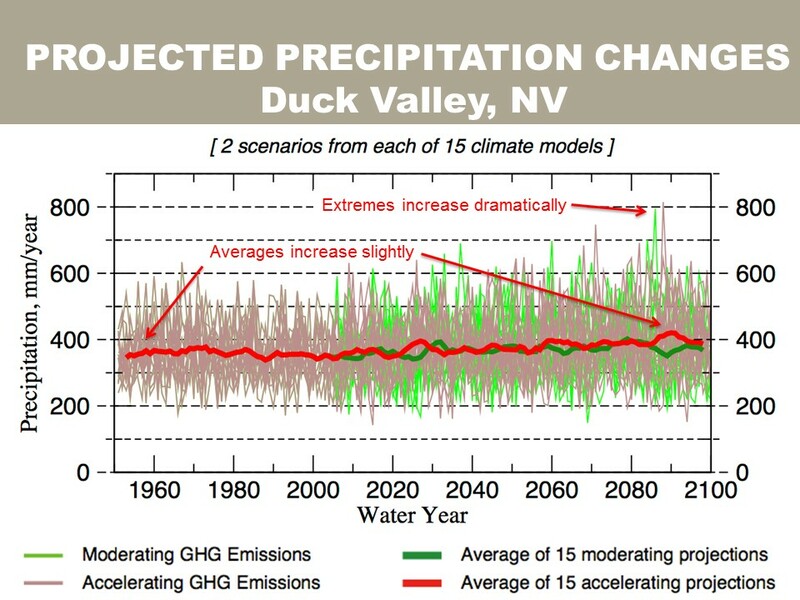 An example of the climate projections for the Duck Valley Reservation in Nevada is shown below. Dettinger’s projections are now being used by members of the Native Waters project team to investigate adaptation options for tribal partners located in the study area. 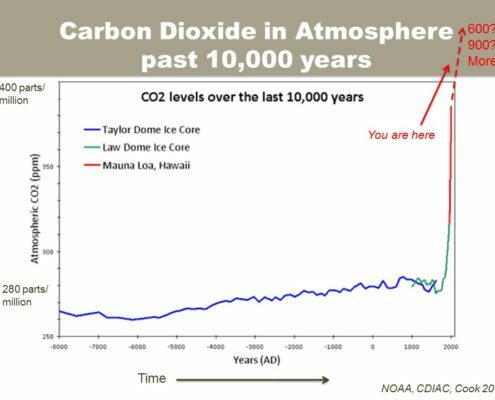 Although tribes of the Great Basin and Southwest have survived large climate changes before, there are key differences between climate change of the past and of the future, Dettinger explains in the podcast. To learn more about Mike’s work with the Native Waters on Arid Lands project, listen to podcast episode 7, below, or view the podcast as an audio-slideshow at the top of this page. Music for this podcast came from Podington Bear (song title: Bit Rio) on the Free Music Archive under a Creative Commons license. For a written transcript of this podcast, please contact kelsey.fitzgerald@dri.edu.